United Airlines will finally wheel its aging Boeing 747 jumbos off Sydney-US routes from April 1st, replacing them with more modern albeit smaller Boeing 777-200s. The upgrade will be welcomed by travellers winging their way between Sydney, San Francisco and Los Angeles, especially in economy, as the 777s sport in-seat video screens – something the Boeing 747 noticeably lacked. All seats also have access to AC power sockets, and the flights will at some stage include inflight Internet. United runs five versions of the Boeing 777 across its fleet. The one that we'll be seeing has eight suites in the carrier's Global First international first class, 40 seats in BusinessFirst business class and 221 in economy, including 117 of the extra legroom economy plus seats. However, that tally of 269 seats is almost one hundred short of the 747's capacity and includes a substantial reduction in seats at the point end of the plane. The current Boeing 747 offers 12 first class suites compared to the 777's eight suites, while business class goes down from 52 seats to 40 seats. With United still enjoying a monopoly on direct Sydney/San Francisco flights, the cutback in premium seats could make things tougher for business travellers trying to match their schedule to United's seating availability. With the loads on the UA flights to Australia, does anyone really think that they're just going to live with less revenue? I think not. This is only half a story. I predict UA is going to "fix" the backtrack issue that American passengers face when coming to Australia. Most go beyond Sydney - including huge numbers to Cairns/Port Douglas. They then have to 'backtrack" to Sydney giving QF additional revenue. The most sensible choice would be to add a SFO/CNS/BNE service. That's my guess (and hope). I just curious why it regarded as an "upgrade"? I personally like 747 far more, as least because of second level, and in my opinion an upgrade would be 747-8, while 777 is a replacement. It's an upgrade for Y/Y+ pax, but for F/J pax it's merely a replacement. However it should increase on-time reliability for the routes as the aircraft are newer. Just because aircraft is never and has more frills, particularly in entertainment area it does not automatically means an upgrade. For example you would not count replacement of aged 747 with brand new 737 as an upgrade, would you? Aircrafts of totally different classes. I would say 747-8 or A380 would be an upgrade. And as mentioned in article from F/J POV it is clear downgrade - 777 has least seats than 747. For Y/Y+ pax a brand new UA 737-900ER with BSI and PTV's compared to a 20+ year old 747-400 with worn out seating, yellowing lighting and no IFE would be a massive upgrade. I'd much rather the 737 than 747 in that instance. And doesn't less seats in the J/F cabins mean a quieter, less busy cabin with a better crew:pax ratio? No difference between the 747 and 777 if you're in first or business, but a BIG difference if you're in economy or economy plus due to having real IFE - that's an upgrade. Much greater reliability than the 747 - that's an upgrade. I so agree on reliability, have flown with United to the US a few times and twice have been seriously delayed due to problems with the 747. Yes it's a lovely old aircraft but 'old' is the word, some people should get over their love for a certain type of plane and realise that business travellers want to get from A to B on time and in a decent degree of comfort, if the 747 can't do one or the other or both (if you're in economy) then this 777 is an 'upgrade' for sure! While 777 is great aircraft, I cannot accept your comment about reliability of 747. Brand new Hundai is far more reliable than very old Toyota, so what? So I get to fly to America on time instead of being stuck on the ground for another day, that's "so what". That's happened twice to me so far. You simply missed my point. Do not mix "Type A" vs "Type B" and "New" vs "Old" in the same sentence. NB. Strangely it does not seems that too many 747 fans here. I am surprised - I love this bird and definitely prefer it to anything else. I am conservative person and always prefer tried and proven. Especially when my bacon depends on it. Pity well so often we have not got any choice. What vexes you so? I've read your comments but cannot seem to understand the cause for your consternation? Do you have a romantic attachment for the 747 and feel upset that airlines have not done this aircraft justice by neglecting modern retrofits, which adversely impacts (warranted or otherwise) the reputation of the aircraft? Partially yes, partially I just feel safer on 747 (old aircraft with all – or almost all – bugs ironed out) and last but not least I get sick when people plainly brainwashed but advertisement and propaganda. The ONLY reason why modern plastic-fantastic aircrafts are “better” because they lighter. But it does not mean that it is better FOR ME, and indeed it is better for AIRLINES. And I forced to fly on fishing rod instead of trusty aluminum and titanium – despite new technologies MAY be better it is not proven yet that they ARE better. So I am not in brigade of “Horary! Horary! Tomorrow I am flying 787!! !” – honestly I do not give a damn. I like flight safer and predictable rather then “fun” and “cheap”. And, TRB, what is the reason for your necropost? This thread was dead for quite a while. You'd think they would consider an additional non-stop 777 or 787 service to/from Melbourne and/or Brisbane if the demand is there. Well we now know the answer to that today withnthe announcement of LAX-MEL direct from October. Maybe we could get the often suggest Houston - Sydney or Denver - Sydney 787 flts. Have also heard they always look at EWR - Sydney direct service via HNL whenever they get a chance. Agree, it is really sad - 747 great aircraft and great piece of aviation history. Among big players only Lufthansa shows interest in 747-8 and even they already talking to phase them out in favor A380. Boeing really get too late with 747-8. ...and when we're done frothing at the mouth whenever we hear the delightful shriek of a 744, can we accept that being an economy passenger on one of those things is considered torture and that there is in fact an upgrade, even if it's not the plane that sharpens and heightens each sensation? And what "upgrade" you talking about? Pitch in United 747 and 777 exactly the same - 31". Will bigger screen save your from torture? Airlines like us to believe so. I can see they succeeded at some instances. There is ONLY estate on long haul - space. And frankly it remains the same. Are you insane? This is a product that even Jeff himself admits isn't up to par. Has anyone else realised that the picture at the top is that of a 747 upstairs cabin? Not convinced - I see two aisles. Gangway, legs back is the cry for flight attendants on United as they wield their trolley on sleeping passengers. Glad to see the last of those ancient noisy 747's United were running but you still won't get me on a flight with them. I thought 747 was 2-4-2 but 777 only 2-2-2? The 777's have lower cruising speed than the 747's so the trip to and from Sydney is actually longer by 30 to 40 minutes. This results in a smaller window for delays before the flight is cancelled due to crew hours. I just experienced a terrible flight on UA839 from LA to Sydney. Flight cancelled in LA due to crew hours. Flew 24 hours later. Flight landed in Honolulu due to engine problem. Stayed 28 hours in HNL. Finally arrived in SYD 2-1/2 days later than scheduled. Customer service by UA during these episodes was not good and and certainly not generous. Opportunity for upgrades from Economy to Business are greatly reduced due to reduced number of seats in Business. 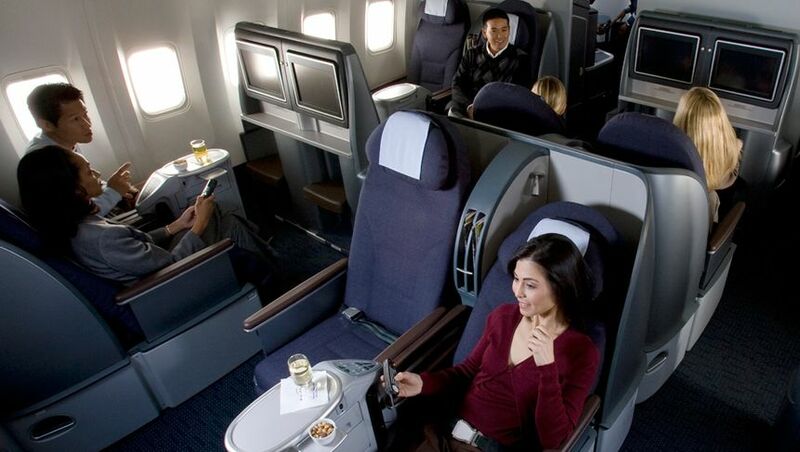 In economy on the UA 777 there are only 4 toilets for 221 people. That's 55 people per toilet. There is often a queue for toilets and by the end of the flight the toilets are a mess. Comment on "United upgrades Sydney flights to Boeing 777s"